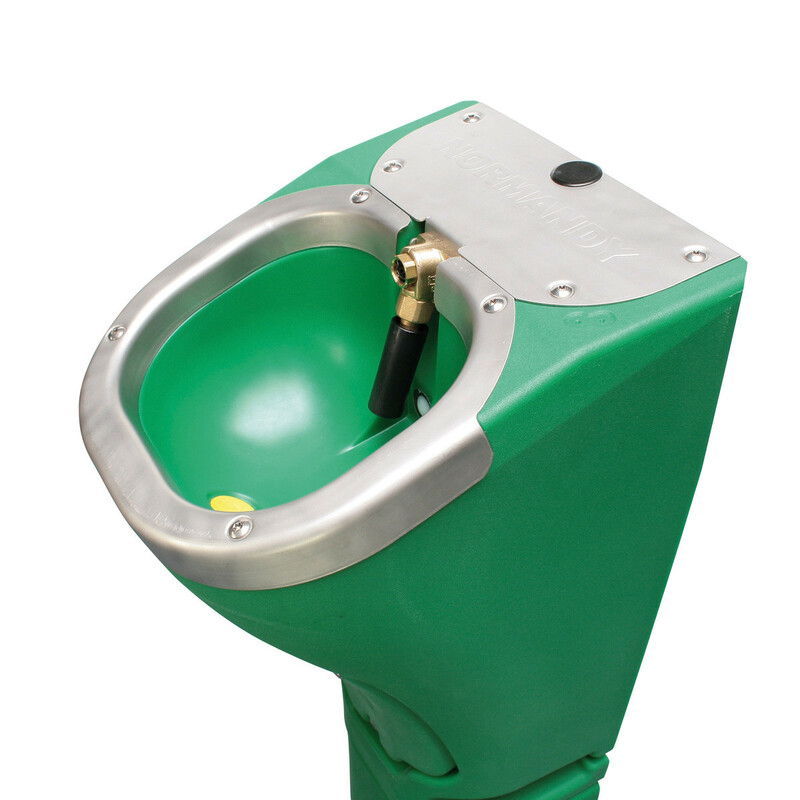 Wall-mounted drinker in HDPE with push tube. Mounted against the wall on a stand (option A576) with small diameter, the NORMANDY takes up very little space. With its straight back and sides this drinker also fits perfectly in a corner while leaving the walls clear when they are sliding. The large bowl allows easy access to the water. Smooth operated tube valve with adjustable flow rate. 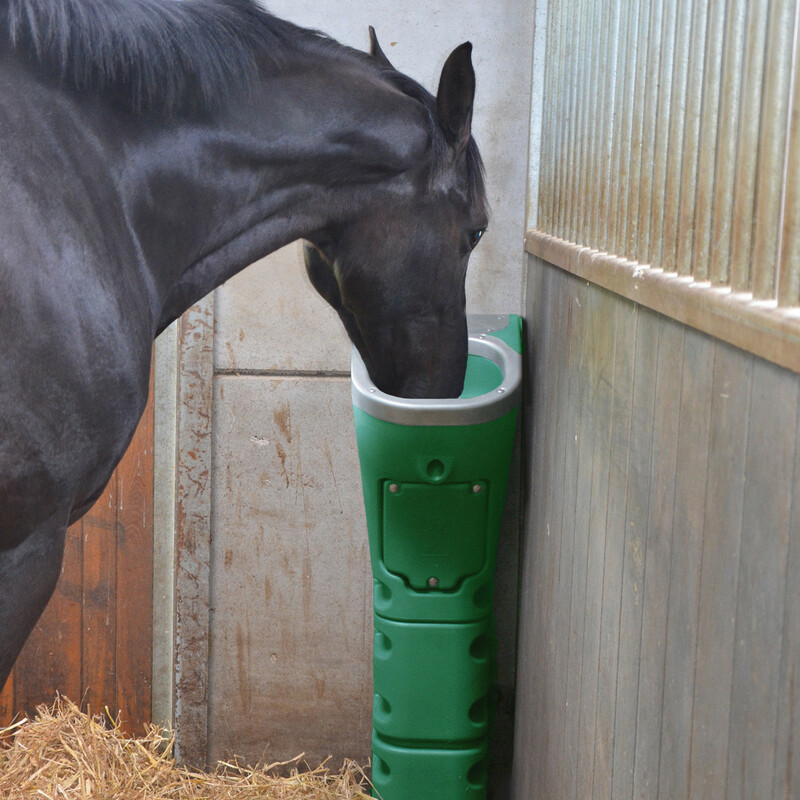 The drinking height can be adapted to the size of the animals by cutting the stand in two, or by not using it. The rounded shapes of the drinker and the stand avoid the risk of injuries to the animals. The sturdiness of the rotomoulded seamless food safe HDPE drinker has been tried and tested. The stainless steel edge prevents the animals from chewing on the plastic rim. The double-walled, foam-filled PE stand is highly resistant to shocks and offers a first insulation of the water supply lines (option A576). The valve is protected from the animals by a stainless steel cover. An 80 W heating element (optional anti-freeze power set A396 for the bowl and valve) keeps the drinker frost-free. The numerous fixing points allow easy and efficient wall mounting. Top or bottom connection possible. An access door allows easy connection to the water line and easy installation of an anti-freeze power set. Cleaning is made easy with the drain plug that can be removed without tools and the smooth interior of the bowl. Also available with float valve for constant water level: ref. 1717. 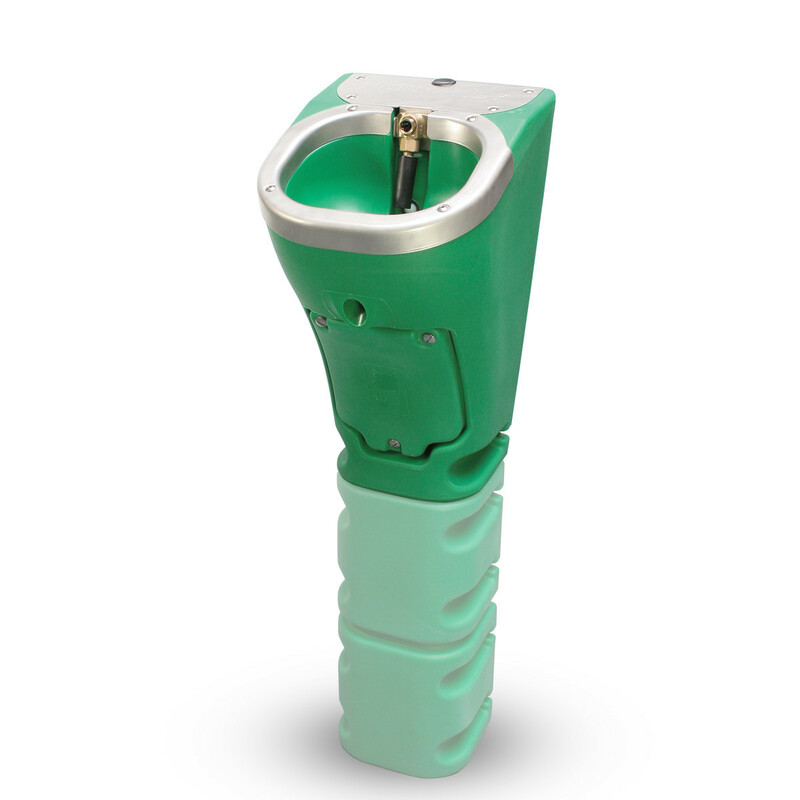 A tube with adjustable flow rate from 0 to 20 l/min. Very easy to push. Confortable, reliable, sturdy and easy to install drinker. If you go for the anti-freeze power set accessories, chose the corresponding 230/24V transformers (ref. A-501 to A-505). Remember to adapt the cross-section of the power cable to the capacity and length of your installation (see chart in the mounting instructions) and you also have to install a fuse on the auxiliary power line.